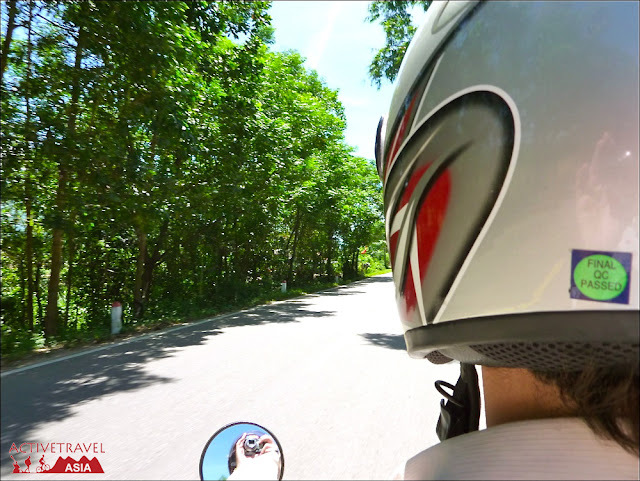 Riding a motorbike from the North to the South of Vietnam was an amazing experience. Now, while I didn’t ride the motorcycle myself (Anthony did an amazing job!) it is still something that will remain with me for the rest of my life. Each day we were faced with new challenges and amazing sights making the journey all the more incredible. I think what made it so momentous was the simple fact that we were in control of where we wanted to go on the trip. It didn’t have to be governed by train and bus timetables (how we normally get from A to B). We were able to stop anywhere we wanted to and take our time to stop and smell the rice paddies! It was hard to pinpoint my favourite memories, but for anyone thinking of doing a trip similar to this, I hope this post inspires you! It was an amazing journey and loved every minute of it! I had always wanted to see the bright green rice paddies that I seen in so many photos and our time in Vietnam I defiantly got what I asked for! We would ride for hours and hours through countless rice paddy fields, each one greener than the last. The fluorescent colour of the neat fields would be on either side of us. 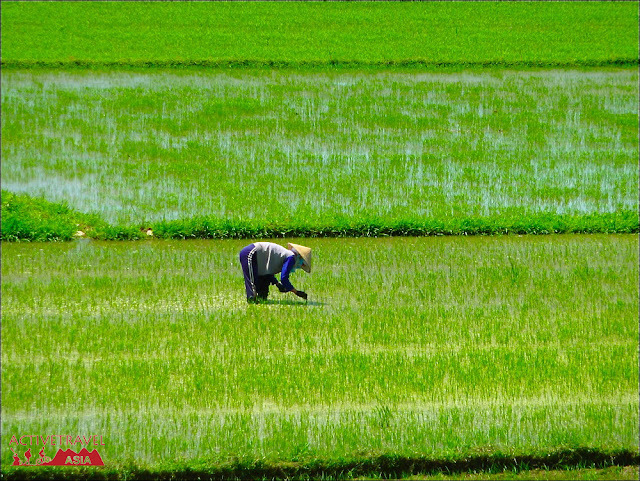 We stopped often just to stare at the endless plains of the newly growning rice. For over half of our trip we were lucky enough to escape any downpour. There would be days we would be riding with foreboding clouds above us, but we never felt a drop. That is until the day we left Hoi An for Dak Glei! We were only about 1 hour away from the town we chose stop at for the night when we turned round a corner of a mountain and right in front of us were heavy black clouds. We could hear the thunder and see the lightening but didn’t feel any rain. Then without warning the skies opened up and the biggest water droplets ever splashed down on us. Of course, that was the day we didn’t have our wet weather gear out and ready! As fast as we could we put our jackets and pants on, already saturated and continued slowly in the rain. We didn’t need to be told again to always have our rain gear out and ready with our bags wrapped up! A common drink in Vietnam is Iced Tea or Tra Da, and it quickly became our favourite drink to rehydrate with whilst on the road. Rather than being a sweet tea it is usually just green tea or another kind of herbal tea with ice added. So thirst quenching and refreshing! We would stop at little roadside cafes regularly to grab one of these cheap and satisfying drinks. Many a time the owners would continually top up our glasses with a big grin. They seemed to be so proud to serve us. At one town, Kham Duc we stopped in and got ourselves tea from a family. Minutes later the wife brought out some freshly baked teacake for us to eat with cream-scrumptious! We had about three glasses of tea each and chatted to the family in broken English. When we were ready to leave and went to pay they would not take our money. No matter how much we plead with them, they would not take our cash. This was true Vietnamese hospitality that we had experienced and were so grateful for. We passed so many buses and trucks on our trip and at times I really did think I burst an eardrum! The horns they use on their vehicles were so loud and they would go for so long. It didn’t mater which way they were coming from the drivers would be sure to blow their horn at least three times if they were passing you or nearing you. Sometimes the horns were unnecessary and were more annoying than anything. 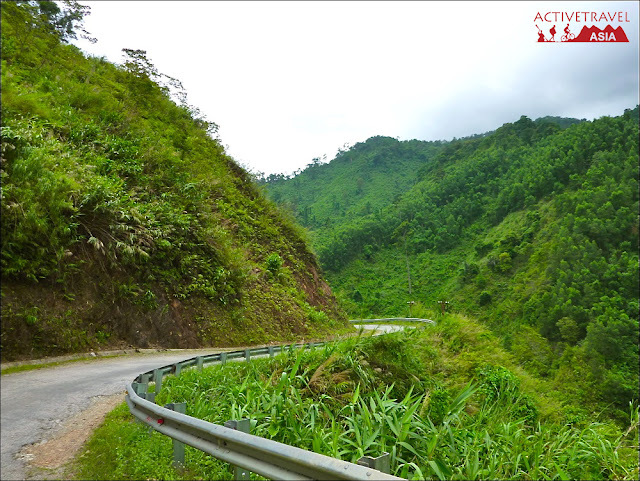 We were thankful when we were along the Ho Chi Minh Road and would not hear a horn for hours on end or even pass anyone else on the road! 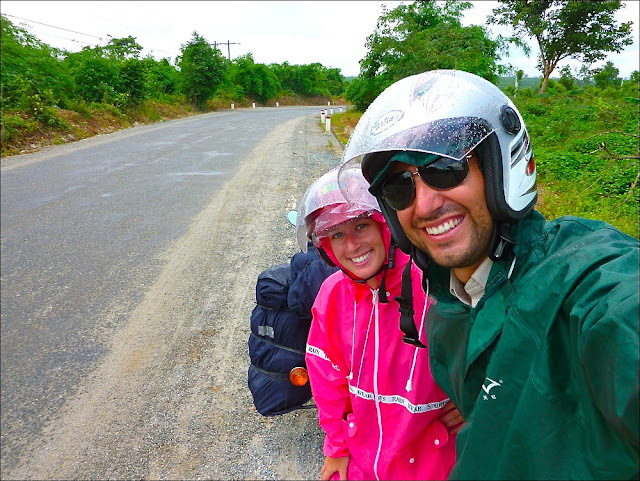 One day we were taking our motorbike through the countryside around Hue so we could independently visit some tombs and mountains. Since I was in charge of the map it was my job to get us to where we wanted to go. (That was our first mistake!) Bumping along a dirt road I soon realised we were going the wrong way and the actual track was on the opposite side of rice fields. The only way across them was on a muddy road full of puddles! 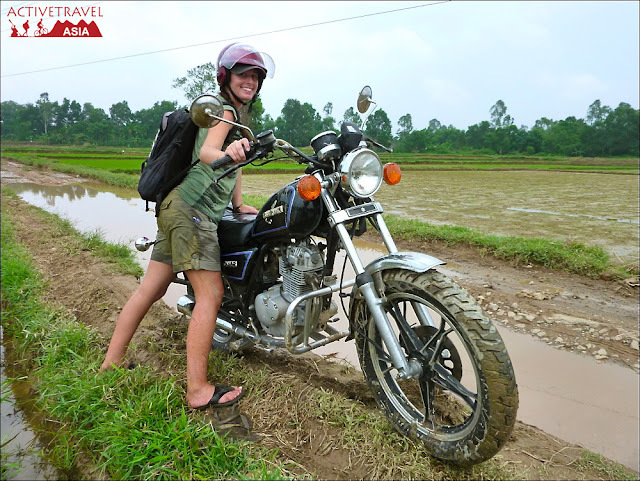 We sloshed our way slowly through but unfortunately our little bike ‘Bullet’ couldn’t handle all the mud and we fell off the road into a muddy rice field below! We weren’t hurt-just dirty, but that didn’t stop us from continuing the day to see the tombs! Thinking of travelling to Vietnam? Contact Us for any questions you need answered!